Each week, TheLines takes a look back at some of the worst sports betting “bad beats” from the weekend of college and pro football. These incredible moments caused a swing in money at sportsbooks, resulting in jubilation — and plenty of pain — for bettors everywhere. This one looked like an easy win. Full disclosure: I had Buffalo -3 and was getting bored watching the game. The Bulls were completely dominating after taking a commanding 29-10 lead early in the second half. The momentum began to shift though when Northern Illinois quarterback Marcus Childers hit D.J. Brown for a 28-yard touchdown to cut Buffalo’s lead to 29-17 with 17 seconds remaining in the third quarter. Not the end of the world. Northern Illinois can’t stop Buffalo. It’s not like the Bulls will suddenly stop scoring, right? The fourth quarter was all Huskies. Childers found Spencer Tears from 32-yards out to get Northern Illinois within five points. Now it was time for Buffalo bettors to get nervous for the first time all game. The Huskies were one score away from covering. The Huskies completed the comeback in dramatic fashion when Childers hit Brown again with just 1:09 left on the clock to give Northern Illinois its first lead of the game. Buffalo had one last drive but it wasn’t meant to be for the Bulls backers. Buffalo’s drive stalled at the Northern Illinois’ 41-yard line and the Huskies held on to win the MAC Championship in a thrilling comeback…for some. Buffalo bettors watched the Bulls jump out to a 13-0 lead in the first quarter, hold a 29-10 edge in the third quarter, only to have Northern Illinois score 20 unanswered points in the final 15 minutes to win and cover. Oklahoma and Texas played a wild shootout earlier this season with the Longhorns winning 48-45. History repeated itself on Saturday in the Big 12 Championship game, only this time it was Oklahoma winning 39-27, and sticking it to Texas +9 bettors in the process. The last few minutes of this game was really a roller coaster of emotions for gamblers on both sides. Texas had been covering the spread most of the game and entered the fourth quarter tied at 27. Oklahoma took a 30-27 lead and then tacked on a safety with 8:27 remaining to go up 32-27. Following the safety, Oklahoma went on an 11-play drive that took 6:27 off the clock and sucked the life out of Texas backers. The Sooners converted three third downs on the drive to bleed the clock but if the Longhorns held on a critical 3rd-and-10 from the 18-yard line, Oklahoma would have to settle for a field goal. Texas just couldn’t get a stop though. Kyler Murray threw a pinpoint pass to Grant Calcaterra, who made a beautiful one-handed catch for the touchdown. Now trailing by 12, Texas bettors needed a touchdown to cover. Then it happened. Lil’ Jordan Humphrey returned the ensuing kickoff for a score. Amazing. However, the touchdown got called back because of a holding penalty. There were some questionable calls in this game but this wasn’t one of them. It was clearly holding on the return. Texas bettors weren’t dead yet. There was always the backdoor cover. Sam Ehlinger drove the Longhorns down to the Oklahoma 18-yard line, giving Texas one final shot at a touchdown. On the next play, Oklahoma’s much-maligned defense shut the back door on Longhorn bettors when Tre Norwood picked off Ehlinger to secure the 39-27 and College Football Playoff berth for the Sooners. A one-handed catch on third down, a kickoff return for a touchdown that got called back and a late interception in the red zone doomed Texas bettors in the final minutes. Remember back in Week 8 when Todd Gurley broke the Internet by taking a knee against the Packers in the final seconds instead of scoring to give the Rams a cover? Well, it almost happened again on Sunday. Luckily for Rams bettors, Gurley mismanaged the clock. The Rams were 10-point favorites over the Lions, but Los Angeles wasn’t sharp coming off its bye. Detroit was covering most of the day until a Gurley touchdown with 6:53 remaining gave the Rams a 23-13 lead. The Lions kicked a field goal with 2:57 left to make it a one-possession game at 23-16. Los Angeles was content to run out the clock, but Rams bettors got a break when Gurley busted free for an easy touchdown. No way. Not again. Gurley stopped at the one-yard line instead of scoring for the second time this season. Amazingly, both times it impacted the spread. There was one significant difference though. This time he did it before the two-minute warning and the Lions had timeouts. Unlike the first time when Gurley made the correct decision by falling down, he should have scored to give the Rams a two-touchdown lead. Everything worked out for Rams bettors. Gurley realized his error on and on the next play, he plunged into the end zone from one-yard out to give Los Angeles a 30-16 lead. Rams backers weren’t out of the woods yet. Matthew Stafford drove the Lions down to the Rams’ 14-yard line for a potential backdoor touchdown. However, Stafford was picked off in the end zone with 17 seconds left on the clock, securing the win for the Rams. Just make a mental note for the future: If you need Todd Gurley to bust a big run to cover a spread, there better be like five minutes left in the game. Anything less and Gurley is stopping short. Well, this is going to be a strange year. The Los Angeles Clippers (15-7) are the best team in the Western Conference? And the Houston Rockets, after winning a franchise-record 65 games last season, sit outside the playoff line in the West? The Boston Celtics are mediocre-at-best? And Kawhi Leonard is an MVP candidate/actually enjoying himself in Toronto? Don’t worry, Tom Smykowski. No need to break out your “Jump to Conclusions” mat. It’s still early, so I’m told. Things can turn around. What does not seem to be changing, however, is the rising popularity of sports betting in New Jersey. Other than a bit of a revenue dip in October (bettors aren’t complaining; it was a friendly month for them), overall handle continued to rise, up to an unprecedented $260 million. Of course, the NFL can take credit for much of that trend. Certainly, though, the NBA has begun carrying its fair share of the load. Of the top 10 games most wagered on in New Jersey last month, at least at DraftKings Sportsbook, six involved the Golden State Warriors. Interestingly, though, two of the top three did not. Actually, DraftKings’ top two NJ sports betting games featured the Trail Blazers: at home against the New Orleans Pelicans on Nov. 1, then at the Lakers nearly two weeks later. Behind Golden State, the most bet-on teams at DraftKings in November included the Philadelphia 76ers, Boston Celtics, Raptors, and, surprisingly, the Brooklyn Nets. Conversely, the Cleveland Cavaliers, Dallas Mavericks and Phoenix Suns saw the least amount of action. DraftKings was also home to a pair of monster parlays. On Nov. 4, one bettor wagered $10 on a 12-leg NBA/NHL parlay, one that held 896.27/1 odds and paid nearly $9,000. And on Thanksgiving, a $50 bet on a six-leg parlay paid out almost $6,800 thanks, in part, to the New York Knicks taking down the Celtics (a +1000 moneyline) and the Sacramento Kings upending the Utah Jazz (at +330). Kambi, which powers three of the biggest online sportsbooks in New Jersey, reported an even split between in-game betting and traditional pregame wagering: 50.1 percent to 49.9 percent, respectively. Regarding in-play, one in every 16 wagers addresses the “next field goal” market. Outside the moneyline, according to Kambi, the most popular pregame markets include player points lines, team spread and points line parlay, and rebounds by players. For player points bets, LeBron James and Kevin Durant see the most action. FanDuel also noted that the biggest NBA days for FanDuel are Fridays and Wednesdays, a result of a higher volume of games those days without much football with which to compete. Interestingly, during last week’s Thursday night NFL game between the New Orleans Saints and Dallas Cowboys, many of the patrons in the sportsbook’s simulcast lounge watched less of the football game and more of the Golden State-Toronto matchup. Two months in, clearer pictures begin to emerge on the potential of NBA teams this season. As such, for those who participated in the NBA/MGM $1 million over/under contest, egos begin inflating more or deflate enough to fit the comfort of New England QB Tom Brady. With help from FiveThirtyEight and its NBA predictions based on Elo ratings, we can examine each team’s current record and get a glimpse of their potential futures. Let’s begin with the Eastern Conference. Boston Celtics: This was supposed to be the year, Boston. You’re healthy. You’re at full force. You don’t have any excuses this year. The World Series parade beer-can-hurling was a celebration. Keep nose-diving and you’ll have thousands of this guy to deal with. Brooklyn Nets: Name the Brooklyn starting five. Go. No? Ok, name three players on the roster. Go. Still nothing? I don’t care. Which apparently is the mindset of anyone the Nets have played this year. 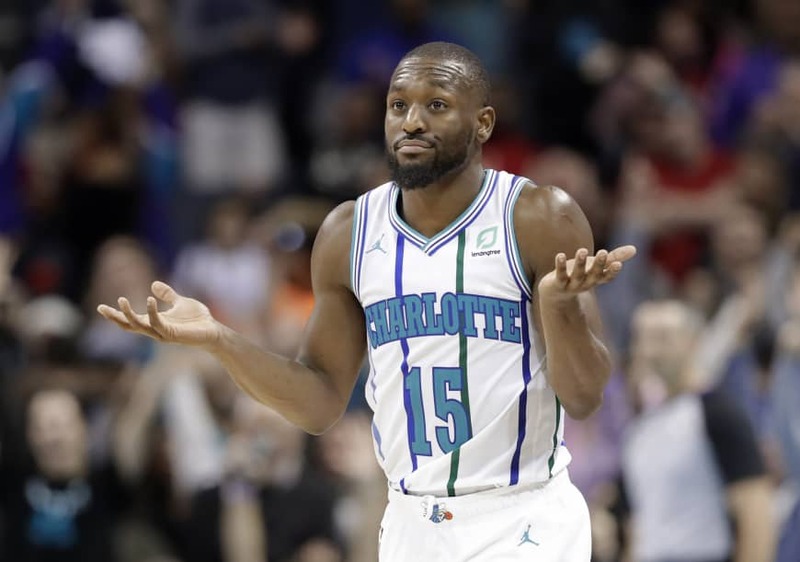 Charlotte Hornets: Poor Kemba Walker. He needs to go for 50 a night just to give Charlotte a chance. There’s still hope. And if nothing else, they still have the 30th anniversary season to celebrate, replete with nostalgic throwbacks and that DOPE COURT DESIGN. Cleveland Cavaliers: Fell into the typical Cleveland trap. Thinking a bunch of rag-tag guys could somehow be at least mediocre. Oh, well. When to pitchers and catchers report? Milwaukee Bucks: How is it the Bucks can get all Hulkamania on the Blazers one night, winning by 43, then turn into first-half Little Giants two nights later and lose to the lowly Suns? Here’s hoping that inconsistency becomes more consistent. Or at least that Giannis Antetokounmpo stops being such a damn beast. Golden State Warriors: Clearly it has become clear that Stephen Curry is the most important piece of the Warriors puzzle. He missed all but two-and-a-half games in November. In those 11 full games without the point guard: Golden State went 5-6. Houston Rockets: Insert party dance gif here followed by a video montage of happy crying moments. Los Angeles Clippers: Here it is, the most overlooked, most forgotten, most best team in Los Angeles (don’t @ me). Sweet Lou Williams is an all-star, or he should be. Tobias Harris is ballin’ out. And friggin’ Danilo Gallinari is playing like it’s 2007. Minnesota Timberwolves: What is this? Minny trades away the tyrant King George and all of a sudden you remember how to play well? Stop it. Stop this now. Oklahoma City Thunder: See above. I won’t repeat myself. Steven Adams is the real MVP, though. Who ya got for the end-of-season hardware? Hot take alert. Pull the fire alarm, get out the fire extinguisher, and get out the milk to help ease the spice. The Warriors are still the heavy favorite for the NBA title, so heavy that not even Tony Perkis stands a chance at reforming them into skinny winners. Golden State holds -200 and -160 moneylines at DraftKings and FanDuel sportsbooks, respectively. The Celtics (+700/+750) and Raptors (+900/+750) sit as the top contenders from the Eastern Conference. Interestingly, despite a one-win October schedule and another losing skid to end November, the Rockets, +900 at DraftKings and +1000 at FanDuel Sportsbook, are still considered a top prospect for the NBA title. The teams climbing the ladder include the Bucks (+10,000 preseason at FanDuel, currently +2000) and the Pelicans (+9000 preseason at DraftKings, currently +3500). Of note: Curry continues to be a top contender for the MVP, despite the fact that he missed 11 of the Warriors’ 14 games in November, while Durant, at a 50 percent success rate, carried Golden State through the month. Where’s the respect for Damian Lillard? Dude’s ballin’ for arguably one of the biggest surprise teams of the early season. No love for the Blazers guard? One of six players in the league averaging 27 points, 6 assists and 5 rebounds? The other five are serious contenders, after all. Lillard, though: +4000 at DraftKings, +6000 at FanDuel.